Our opening times vary between 9:00am – 8:30pm. Times are subject to change depending on the season. Check here before you travel. 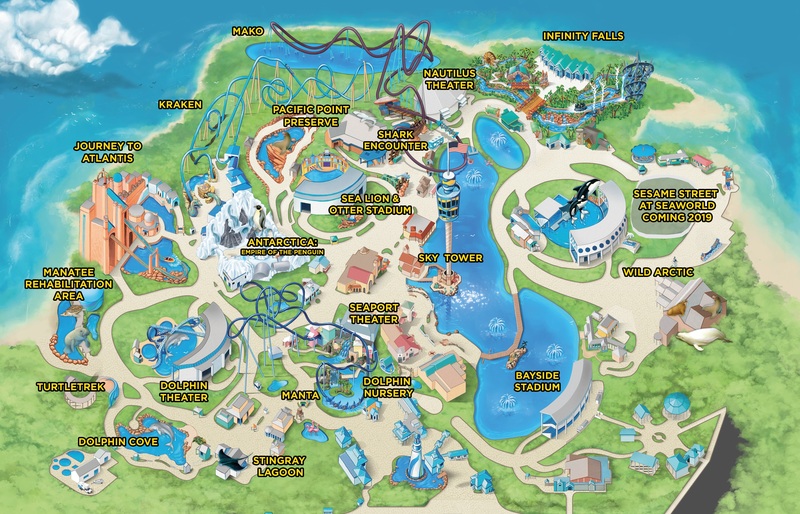 The main entrance for SeaWorld is on Central Florida Parkway between International Drive and Sea World Drive. SeaWorld is approximately 10 minutes south of downtown Orlando and 15 minutes from Orlando International Airport. 7007 Sea World Drive, Orlando, Florida 32821. Take FL-528 (Beachline Expressway) west to the International Drive exit (exit #1). At the second set of lights, turn right onto Central Florida Parkway. The entrance to SeaWorld is on the right-hand side of Central Florida Parkway. Take I-4 East (toward Orlando) to exit 71. This is the SeaWorld exit. Bear right onto Central Florida Parkway when exiting ramp. The main entrance to SeaWorld is on the left-hand side of Central Florida Parkway. You will see a sign for SeaWorld Orlando. Spaces are available for cars, motorcycles and recreational vehicles. Preferred parking is also available. Parking is free for guests who have purchased the 3-Park Ticket or the Discovery Ultimate Package. Just show your ticket to the parking attendant. Looking for great value? Looking for great choice? Looking for something special? Your family can enjoy great food all day long…for one great price! Savour casual "castaway cuisine" at Mango Joe's. Island flavours are the source of the fun in everything from tropical salads to hearty "Joe" burgers and sandwiches. You'll love the unique atmosphere! Menu includes: Mango Fruit Salad, Turkey/Ham Stack Sandwich, Chicken Tender Platter and Garden Burger. Children’s menu includes: Chicken Nuggets, Hot dogs and Turkey and Cheese mini sub. Seafire Grill offers innovative meals with Tex-Mex flavours. Enjoy famous steak and chicken fajitas and delicious salads.Menu includes: Baja Cobb Salad, Fajita Sandwich, Cuban sandwich, Tex-Mex Rice Bowl, French Fries and Potato Salad.Children’s menu includes: Chicken Tenders and Hot dogs. At Seaport Pizza you will enjoy a delicious pizza baked to perfection for rich taste and texture featuring only the freshest of ingredients, including sun-ripened tomatoes and fresh herbs. Menu includes: Cheese Pizza, Pepperoni Pizza, Supreme Pizza, Veggie Pizza, Assorted Desserts and Assorted Fresh Fruit. Enjoy All-American fare prepared with Spice Mill’s signature seasoning. Let the waterfront breezes wash over you on the outdoor patio or enjoy air conditioned comfort in the spice filled dining room. This Waterfront favourite combines a wonderful with beautiful décor, great music and panoramic views for a fabulous family-friendly dining experience. Menu includes: Homemade Vegetarian Low-Fat Chili, Burgers, Buffalo Chicken Sandwich Platter and Chicken Caesar Salad. Children’s menu includes: Chicken Nuggets, Hot dogs and Burgers. The Terrace Bar is perfect for those who don’t want to linger over a long lunch! Grab something quick but delicious. Menu includes: Turkey Legs, Turkey and Ham Sandwiches, Nathan's Famous Hot Dogs, Mini Donuts and Peach Cobbler. Find out why so many guests call this the best BBQ in Orlando! Our BBQ masters understand the patient art of slow-smoking over genuine hickory wood to give every succulent bite of meat that deep, smoky flavour. Menu includes: Voyager's Sampler Platter (Chicken, Spare Ribs & Beef Brisket), BBQ Chicken Platter, Smoked Brisket Platter, Baby Back BBQ Rib Platter, Grilled Chicken Spinach Salad and Everyone's Favourite Turkey Sandwich. Children’s menu includes: Chicken Nuggets, Macaroni and Cheese, Hot Dogs, BBQ Ribs and Turkey & Cheese Sandwich. Eat here amongst the ocean’s most intriguing and ancient predators – sharks! Appetisers include: Chilled Jumbo Shrimp Cocktail, Mussels, Coconut Chicken Tenders, Godzilla Roll, Warm Spinach and Artichoke Dip, Lobster Bisque and Soup of the Day. Entrees include: Tempura Shrimp, Grilled Mahi Mahi, Grilled Salmon, Ahi Tuna, Seafood Pasta, Filet Mignon 8 oz., Rib Eye Steak 14 oz. and Chicken Portabella. Children’s menu includes: Jumbo Grilled Hot Dog, Shark's Chicken Tenders, Kids Fish Dinner and Penne Pasta with Red Sauce. Reservations can be made on the day of your visit after 10:00am, by visiting the restaurants check-in desk. How do I redeem my All-Day Dining Deal and Quick Queue Unlimited? Exchange your paper ticket for a wristband at the Information & Reservations Counter. What time is my pre-booked tour? You can only find out the time of your tour on the morning of your visit. We advise all guests to check in at the Information & Reservations Counter no later than 10.00am. You will then be advised when and where to meet your tour guide. What time is my Up-Close Dining experience? You will be informed by the attendant at the Information & Reservations Counter. Large hard or soft coolers, glass containers, food, drinks and picnic lunches may not be taken into the park. Guests with special diets, baby formula or baby food may bring their items into the park. ATMs are located throughout the park. MasterCard, Visa, American Express, Discover and JCB are accepted at all restaurants and gift shops with ID. Is Wi-Fi available in the park? Wi-Fi is available and free of charge for all guests. Simply search for the SeaWorld network upon arrival at the park. All-day lockers are located outside the park near the Exit Gifts Shop and inside the Main Entrance behind Shamu's Emporium. All-day rental price for a standard locker is $10, large locker is $13 and jumbo is $15. One time use lockers are also available at Journey to Atlantis, Kraken, and Manta for an initial rental fee of $1.00 and $2.00 for each additional hour. Is it possible to hire a wheelchair or stroller at SeaWorld? Wheelchair and stroller access is provided at all shows and attractions. For safety reasons all strollers must be parked outside of most exhibits and attractions. SeaWorld is not responsible for strollers or their contents left unattended in the park. Guests must be 18 years or older to rent a wheelchair. Can I use my own camera on the rides? Selfie Sticks or any hand-held extension poles for mobile devices are not permitted on any ride. Chest-mounted and wrist-mounted harnesses are allowed, however, this is at the discretion of the ride attendant.